One of Norman's highest priorities as the director of H.A.M.M.E.R. was to keep the public feeling safe and protected, this was not an easy task the moment Loki disguised herself as the Scarlet Witch (aka Wanda Maximoff) and infiltrated the Mighty Avengers. Her infiltration was prompted by her desire to embarrass Osborn publicly. Technically, Pym's team (which consisted of Stature, Vision, Jocasta, Hercules, Amadeus Cho, Quiksilver, and U.S. Agent) called themselves the Avengers not the Mighty Avengers, but for the sake of simplicity I'll refer to them as the Mighty Avengers. In fact, that very premise was a constant feature throughout Osborn's dealings with Pym, that is, which team should be called The Avengers. Loki created quite a stir with her first act as the Scarlet Witch when she created an apocalyptic-type storm that caused blood to rain down onto the streets of New York City. 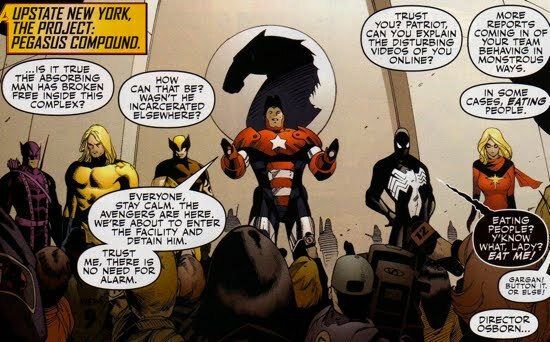 Osborn was forced to reassure the public that everything was under control. Natural disasters break out across the globe and Loki used this disturbance to reunite the Mighty Avengers under Pym's direction, she was successful. Pym's team kept their headquarters in interdimensional space at the Infinite Mansion and they were authorized to work outside the U.S. by the international organization known as G.R.A.M.P.A. This accomplished two things, the group remained outside of Osborn's jurisdiction and they were so successful overseas as the Avengers that many started to doubt Osborn's capabilities back home. Obviously Norman was not very pleased about Pym's actions and Loki prepared to push Osborn over the edge. She initiated the escape of the Absorbing Man (aka Crusher Creel) from Osborn's detainment and manipulated the villain to stir up trouble at the Pegasus Compound, a facility under H.A.M.M.E.R. jurisdiction that housed the Cosmic Cube. The Absorbing Man eventually found the Cosmic Cube and absorbed its powers, both Pym's and Osborn's team arrived to defeat Creel. The teams were unsuccessful at first as Creel dismantled both Avenger teams and exposed their true nature. Osborn soon uncovered that the key to defeating Creel was to use his ball and chain against him, because his weapon takes the same properties Creel. Amadeus Cho hacked into the H.A.M.M.E.R. database and informed Pym about this possibility for defeating Creel and the race was on to find the ball and chain. Pym beat Norman to Creels weapon, but it turned out that the ball and chain, although enchanted, was not enough to defeat Creel. Perhaps Loki rethought her original ploy to embarass Norman or perhaps this was part of a larger plan, but while Pym battled Creel, Loki offered Norman the key to victory. She (I guess 'he' now because Loki began taking the image of a man again) gave Norman a sword that could function as a 'spellbreaker' to undo the Asgardian charm that served as the source of Creel's power. Norman used the sword and defeated Creel, earning himself a very public victory. After a receiving accolades from the crowd, Osborn took care of one last piece of business, he stripped U.S. Agent of his rank. Since U.S. Agent is a member of the armed forces, he was under Osborn's jurisdiction, so he punished the soldier for colluding with 'fugitives'. Pym and his team left feeling somewhat deflated, but Pym was able to uncover one last key piece of information...that the Scarlet Witch was in fact Loki in disguise. This was really just the beginning of the end for Norman and his Dark Reign, despite his victory. The manipulative tendencies of Loki were rearing their ugly head and Norman's vulnerabilities were becoming exposed. This was not the last Osborn saw of Pym and his team, they became integral in Osborn's downfall during his siege on Asgard. 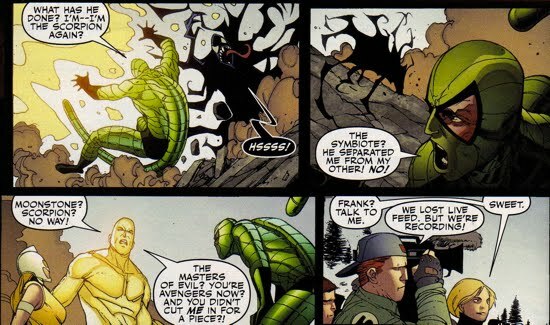 After Peter Parker released footage of Norman Osborn experimenting on human beings, Osborn quickly did damage control to prevent the negative press. We can see here that his efforts to squash Parker's jab was not completely successful because many still questioned his tactics. While Crusher Creel was destroying the Avengers, the Cosmic Cube gave him the power to expose the true nature of Norman's Avengers. Sofen and Gargan were exposed as their old villainous identities while news cameras recorded. However, there does not seem to be any immediate fallout from that incident...why? And speaking of Crusher Creel, this was not his first run-in with Norman. 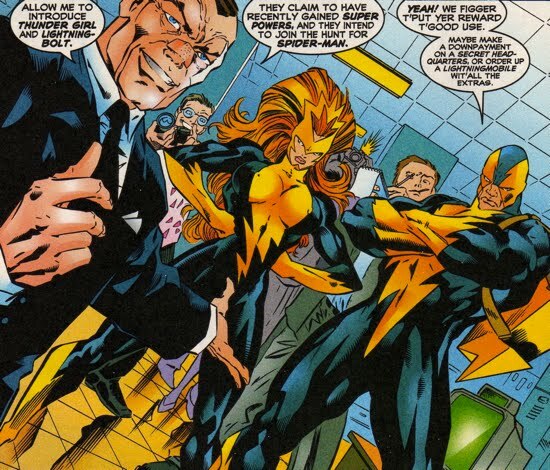 When Osborn was part-owner of the Daily Bugle, he hired Creel and Titania to pose as the heroic (albeit Thunderbolt-inspired) duo Thunder Girl and Lightning Bolt. Osborn later double-crossed them to save face publicly, so he and Creel most likely are not on the greatest of terms.